Preposition Lesson is very useful for English Grammar. All Preposition lesson discuss here. 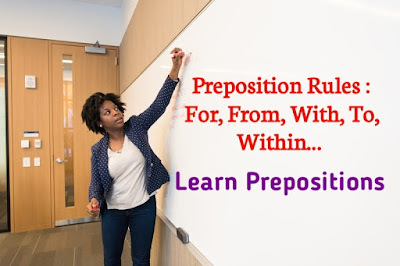 If you want to learn Preposition, then you daily read our blog. We help to learn preposition with Preposition Examples. We suggest you, please read all the blog post. We write here all preposition lesson with Preposition Examples. Today we discuss useful rules From, For, With, Within, To. We discuss all Preposition rules on Our Blog. You can also read definition, kinds, use, Prepostition examples here. Subsitute a noun for a verb.